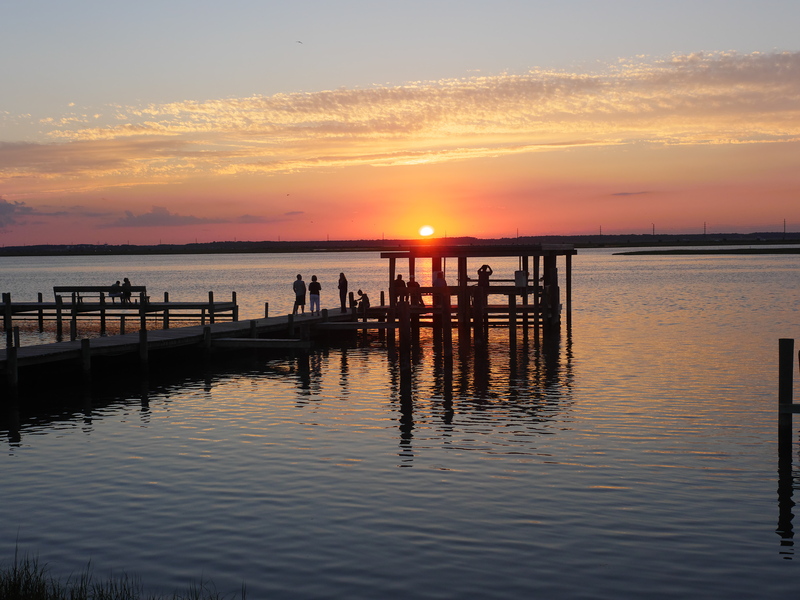 If you are looking for vacation tips for visiting Chincoteague Island with your family, you are in the right place. Chincoteague Island has a small town and is most well-known as the inspiration for the children’s novel Misty of Chincoteague. 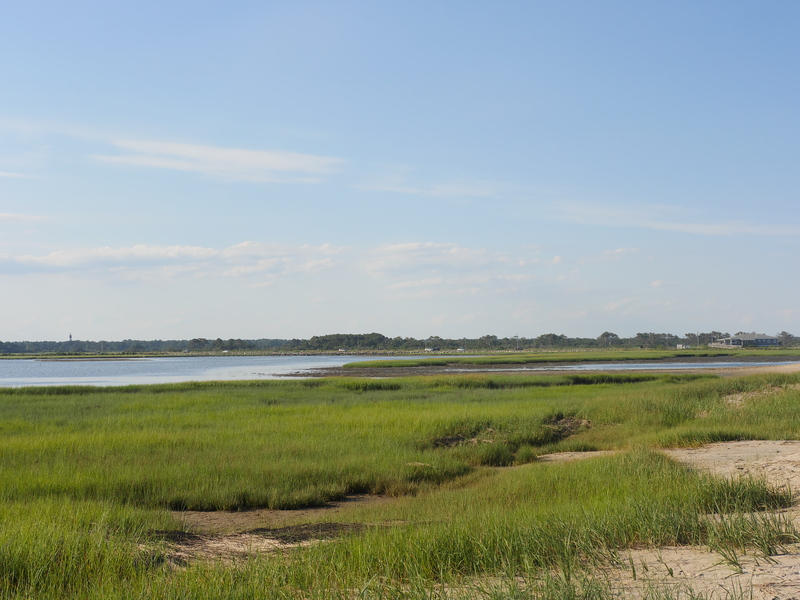 From the beautiful white sands of Assateague Island National Seashore to the wild Chincoteague ponies, the area offers plenty to do with kids, while adults will also enjoy the serene views and a quiet atmosphere. Whether you want a place near the ocean or walking distance to downtown, you can find plenty of options for vacation rentals, hotels, and inns. We stayed at the Anchor Inn, which was a seven minute walk from the downtown area. Our room had two queen beds, a full size refrigerator, and a stove. One of the best parts of the room was that it had a balcony with a waterfront view of the private pier. Since the Anchor Inn is part of the Marina Bay Hotel & Suites property, you can use the pool that joins the inn with the hotel. Not only does the pool overlooks the water for a serene view, but you can also start up the fire pits in the evening to enjoy the sunset. Another benefit of staying at a waterfront property is that you can catch the sunset in the evening. The moment the sun reaches the water will impress the family. While you can find many options for hotels in the area, the Anchor Inn works well for a quiet getaway with the family. Since the pool closes early and the town doesn’t have many late night dining options, you won’t have to worry about being kept up late by other guests. We also enjoyed looking out into the water where we spotted a large horseshoe crab, many little fish, and spectacular views. Many visitors come to Chincoteague Island to catch a glimpse of the Chincoteague ponies roaming free. Although a couple hundred ponies live in the wild nearby, they are hard to find without looking for them. 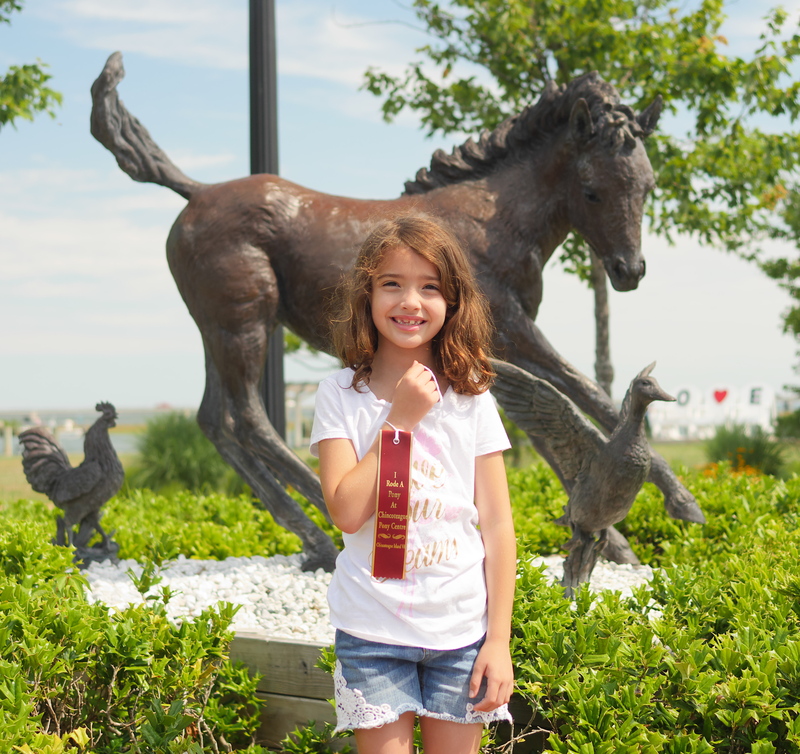 For a guaranteed pony experience, visit the Chincoteague Pony Centre. In the visitor’s center, you can find many pony-inspired souvenirs. From stuffed toys to books, this place is a pony-obsessed child’s dream place to shop. In front, you will find three Chincoteague ponies in pens. Children can ride the ponies for $7. During the ride, two pony handlers lead the pony around the pen about three times. The ride lasts a couple minutes. Although we went early, a line of parents with children rapidly formed behind us. Children grinned as they got off the pony, received a ribbon, and showed it to each other. Seeing the ponies up close, riding them, and petting them made for a wonderful start to my daughters’ day. Another way to see the ponies is to take a boat cruise. 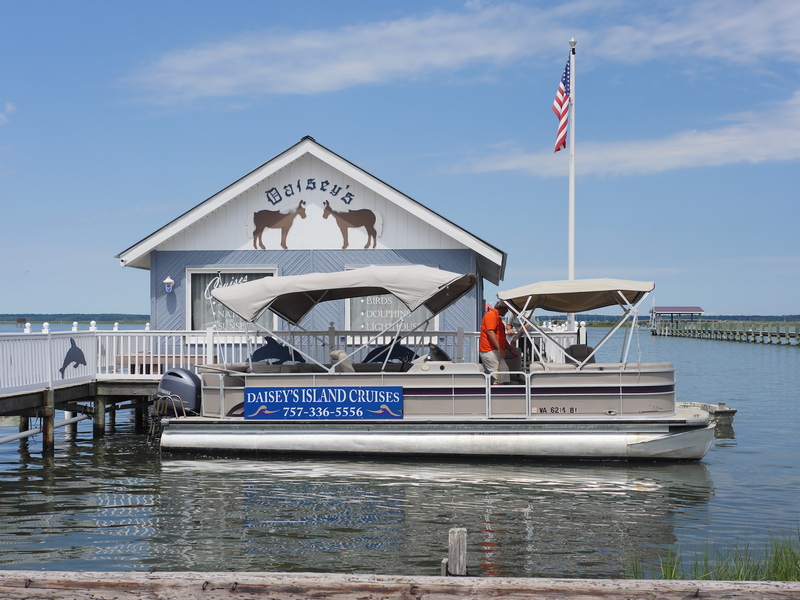 Although there are many choices for boat cruises, I chose Daisey’s Island Cruise. Since this company owns about nine boats, they were the most capable of handling a last minute request for a cruise for six guests. I appreciated that our boat had comfortable seating and offered shade that some of the other boat cruises did not offer. One major advantage of choosing Daisey’s Island Cruises is that the tour guides on the different boats talk to each other during the cruise to give you the best experience. When one guide locates the ponies or another unique find on the water, he tells the other guides to head that way. Our guide also gave us many details about the ponies. He explained how some of the ponies are sold to benefit the Chincoteague Volunteer Fire Company. He was also very generous with his time. As the boat got close to the wild ponies, we all relaxed and took in the view. Not only were my children eagerly grabbing their cameras to capture the special moment, but the adults were also happy to experience our main reason for visiting the island. 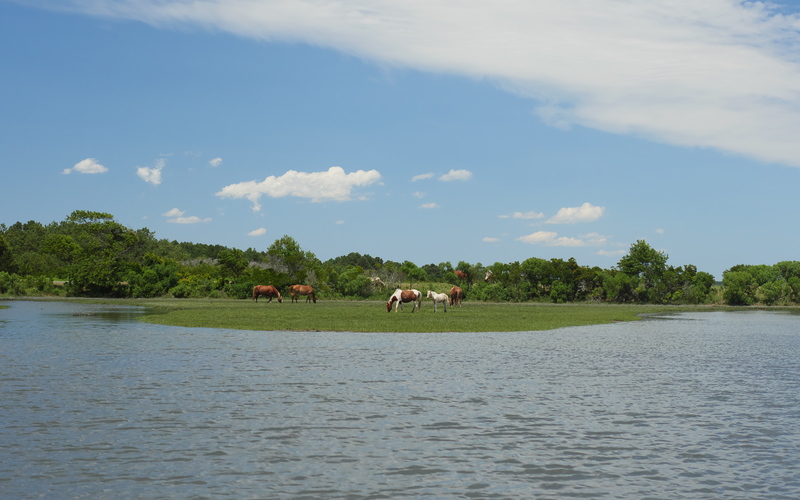 During your boat cruise, you will see much more than just ponies. Bald eagles also live in the 14,000 acres of the Chincoteague National Wildlife Refuge. 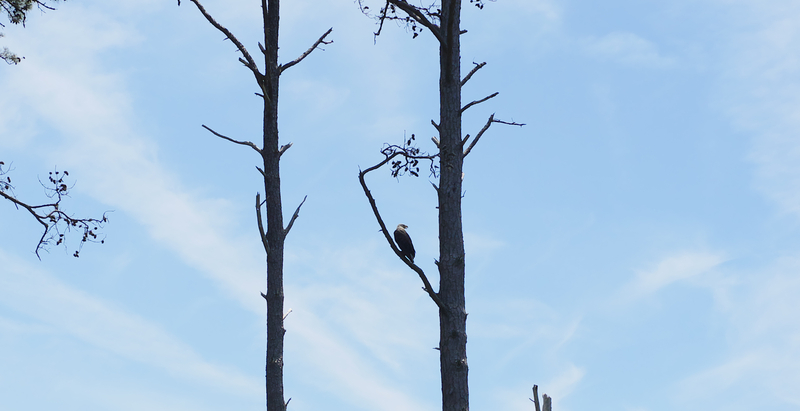 We spotted an adult as well as a baby eagle. 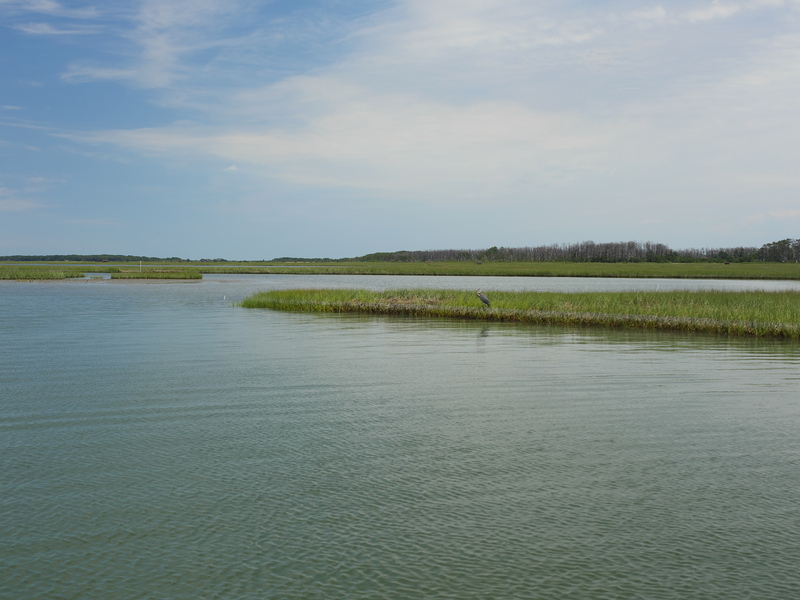 On the cruise around Chincoteague Island, you can see many incredible birds, such as the blue heron. Some people see dolphins, but we were not so lucky. All in all, one of the best parts of the cruise was simply taking in the view, relaxing, and experiencing the vast land that is completely untouched by humans. 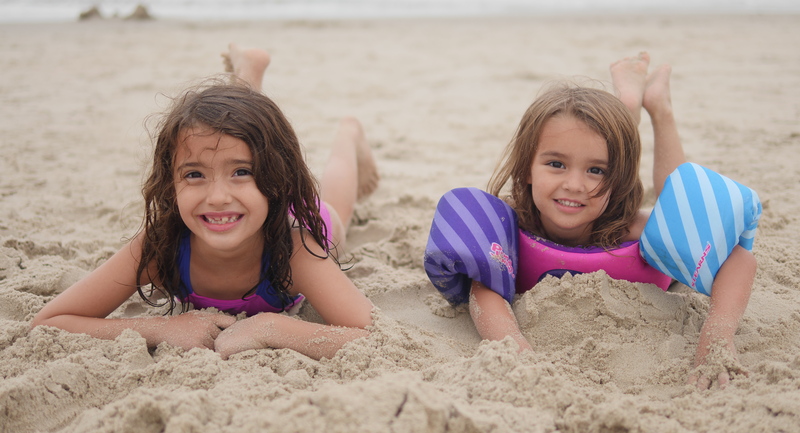 About a 10 minute drive from our room at the Anchor Inn was the nearest swimming location at Assateague Beach on the Assateague Island National Seashore. I visited at about 5:00 p.m when the weather was mild. Parking was easy to find. In the parking lot, you can also find places to rinse your feet and change your clothes. Children will enjoy the white sand, low waves, and wide open space. We didn’t spot any wild ponies on the beach, but we had a wonderful time. 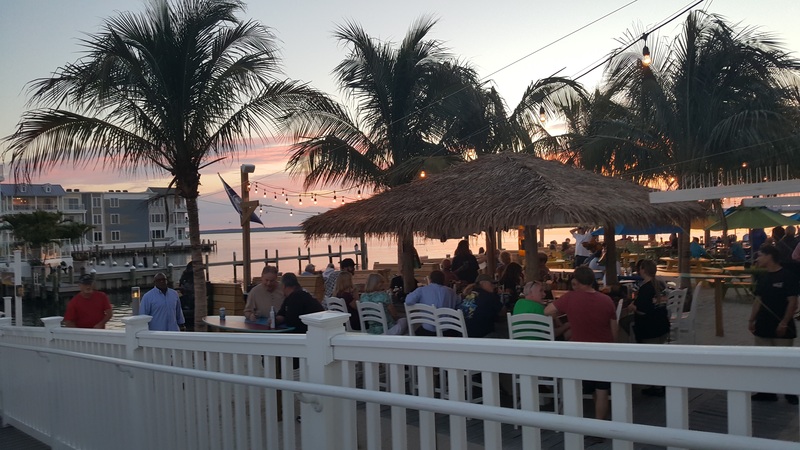 Unlike the crowded boardwalk of Ocean City, Maryland (the most popular beach destination only an hour away from Chincoteague Island), the backdrop to the beach is the bay. Being completely surrounded by nature makes this a relaxing beach getaway. One of my favorite places to eat at Chincoteague Island was Ropewalk Restaurant. It is located within walking distance to downtown and is close to the Anchor Inn. 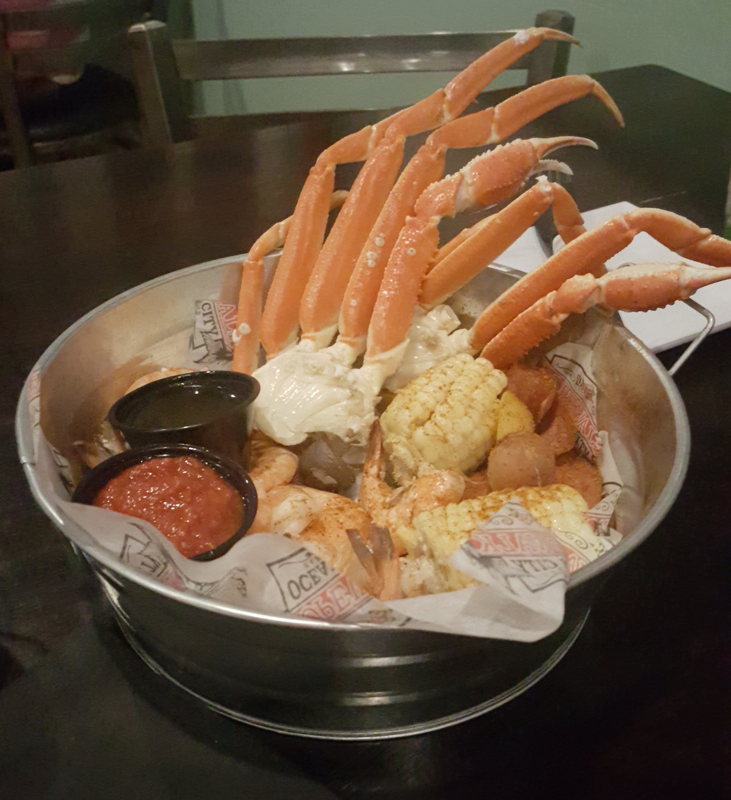 I enjoyed the Deadliest Steam Pot, which had half a pound of snow crab, jumbo shrimp, andouille sausage, and corn. The restaurant also had delicious beverages for a hot day. One of my favorite parts of Ropewalk was its outdoor patio. With a view overlooking the water, you could watch the sunset while eating dinner. To make eating here a unique experience, the floor of the outdoor patio was completely covered with sand. Another part that appeals to children is that the patio connects to a playground. 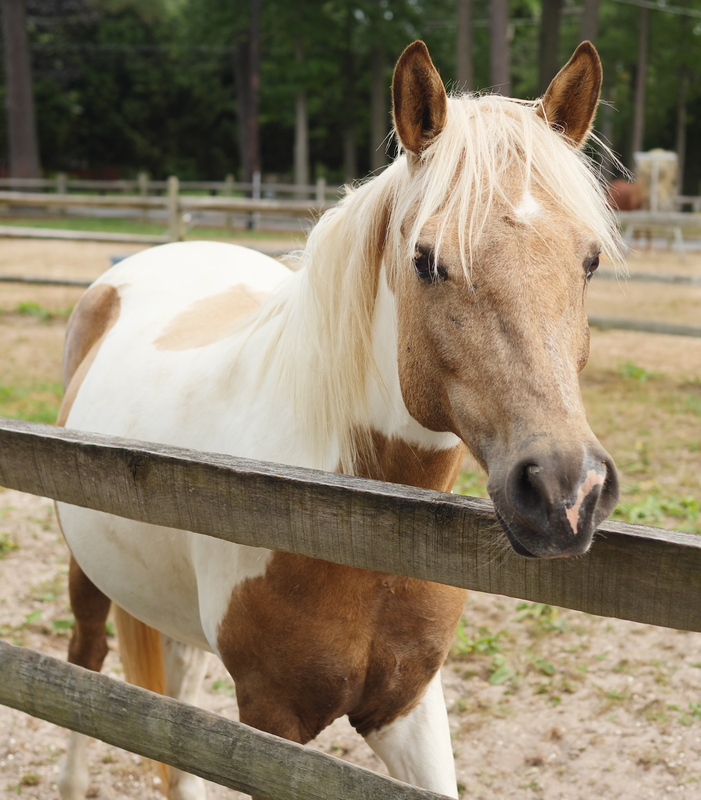 If you want to schedule a riding lesson at the Chincoteague Pony Center, be sure to call ahead of time. 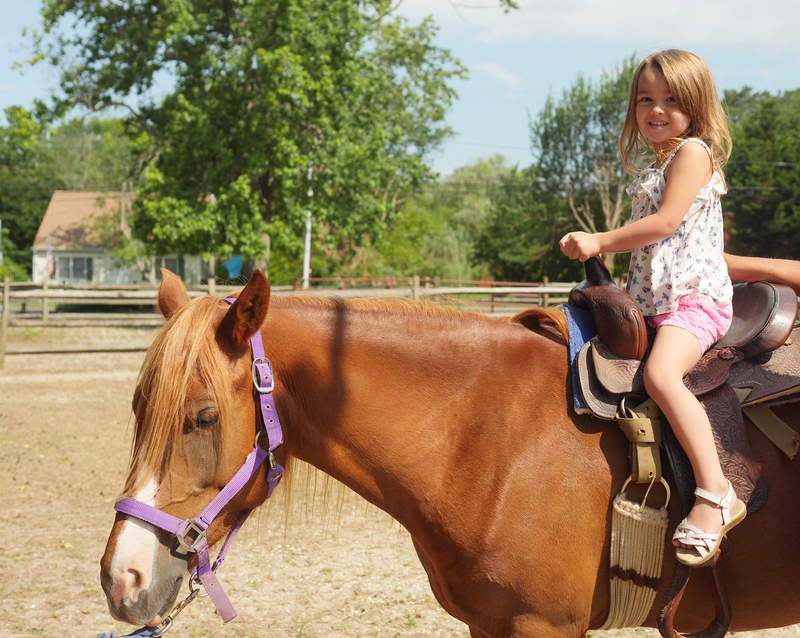 My daughter wanted to take a 30 minute pony riding lesson, but they didn’t have availability until later in the day. Bring a telephoto lens on your boat cruise to get the best pictures. Since the boats need space to move, they cannot get very close to the land where the animals are. Lifeguards watch parts of Assateague Beach, but not all the time. For the safest experience, keep an eye on your children and use a Puddle Jumper vest with children who can’t swim. Taking a boat cruise around Chincoteague Island can be chilly. Bring a sweatshirt. The boat may also have blankets you can borrow. If you are looking for a delicious fish taco, the serving size at Bill’s Prime Seafood & Steaks is very generous and tasty. For local clams and oysters, eat at the Village Restaurant. You can also find good lobster tails there. For more travel tips, visit Theresa’s Reviews on Facebook, Instagram, Twitter, Pinterest, and Youtube. 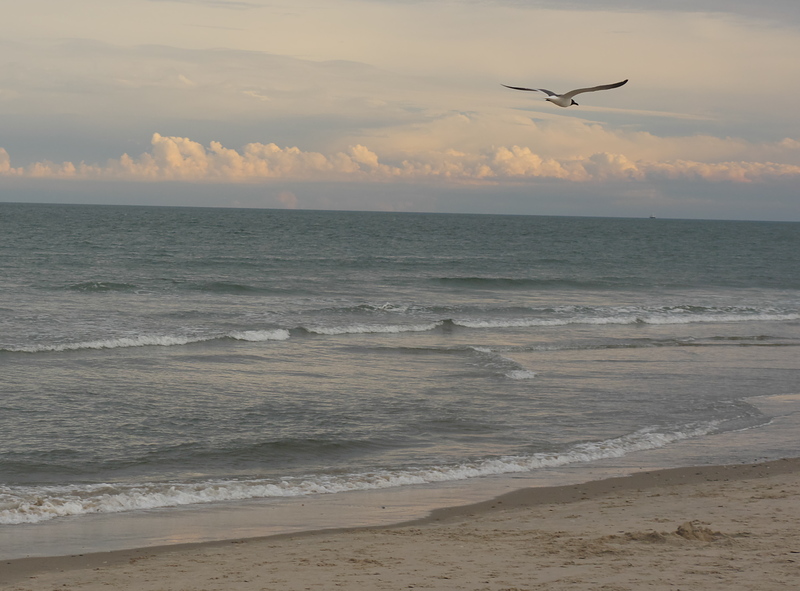 For another beach getaway idea, check out 5 Things To Do In Ocean City, Maryland. What beautiful images! It looks such a great place to visit – so tranquil! Yes, tranquil is the perfect word for it there! I had been following your trip on IG. We visited there once a few years back but have never stayed. Will definitely have to change that now. Your pictures look splendid. Thanks for checking out the article too! I appreciate it. What a fun place for a family vacation. We do love boats and bird watching. The Anchor Inn looks like a wonderful family friendly hotel. It was very nice and comfortable. I loved the view from the pool, but we were usually too busy to swim there! Aww, it looks like you all had a great time!! I loved your photos on Instagram too. 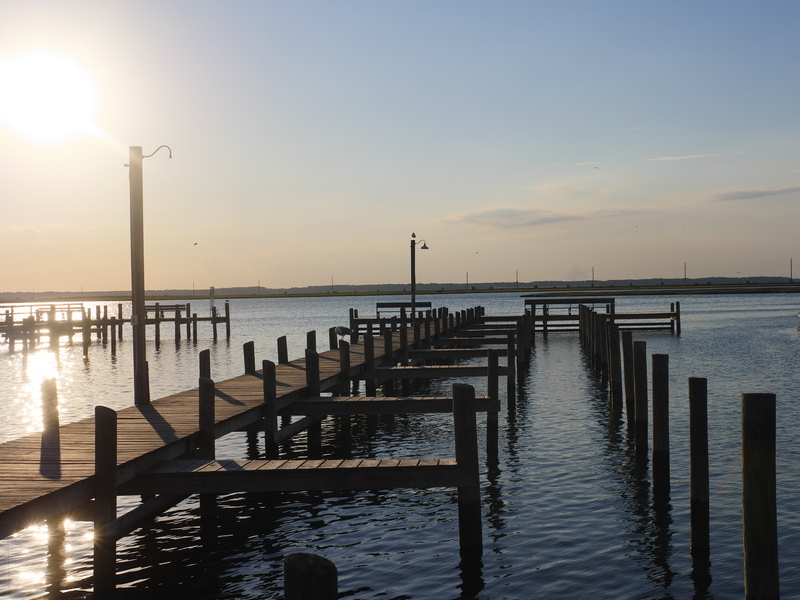 Chincoteague is so beautiful – we’re lucky to have such a cool vacation spot close by! Thank you! You’re right, there are so many wonderful place to vacation here on the East Coast. This isn’t too far for us and it has been awhile since we’ve visited. I think we need to plan a family trip. This looks like such a great getaway! We have been dying to get out of town for a while now. I am obsessed with your pictures. The horses! The views! The crabs (YUM). I think that is a wonderful trip and Im putting it on my list! I had never heard of this island before and it sounds like such a fun trip, and something totally different from the norm. Also sounds super cute for pony lovers!! I had never heard of this place before reading your post. It looks like a lovely vacation spot! It looks like you had a great trip! The Eastern Shore is such a nice area to visit. So beautiful! I’m ready for another beach vacation! How was the temperature of the water? My kids would LOVE the ponies!! It was a little chilly, but the kids didn’t mind! My parents have a house near Ocean City, MD, so we visit Chincoteague every summer. I love it!! So cool and so great for kids! Thanks for the great post. I can see the kids enjoyed it from the pictures. I love ponies too, though haven’t ridden them in the recent years. Oh by the way, your blog looks very beautiful and yet very functional too.